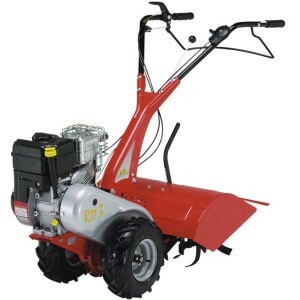 The RTT3 Rear Tine Tiller from Eurosystem is specifically designed for the gardening enthusiast. Powered by the reliable Briggs & Stratton Vanguard 6.5 OHV 205cc engine, the RTT3 Rear Tine Tiller features include a 60cm rotovator working to a depth of 35cm, adjustable and ergonomic handles, easy to use controls and two semi pneumatic wheels. Two forward and one reverse gear plus a handlebar mounted gear disengagement system allows the tiller to freewheel when the engine is off, making it easier to maneuver and transport.